One of my biggest problems with conventional strainers is the space required to store them. It takes a matter of seconds to strain pasta or potatoes, yet my precious shelf space is filled with several bulky strainers. Then, after being used, into the dishwasher it goes, taking up even more space that could be used for several dirty dishes. It's such a silly problem, but it drives me crazy. Thankfully, Kitchen Gizmo has rescued me with their ingenious Snap'N Strain! The Snap'N Strain is simple to use and sturdy for straining. 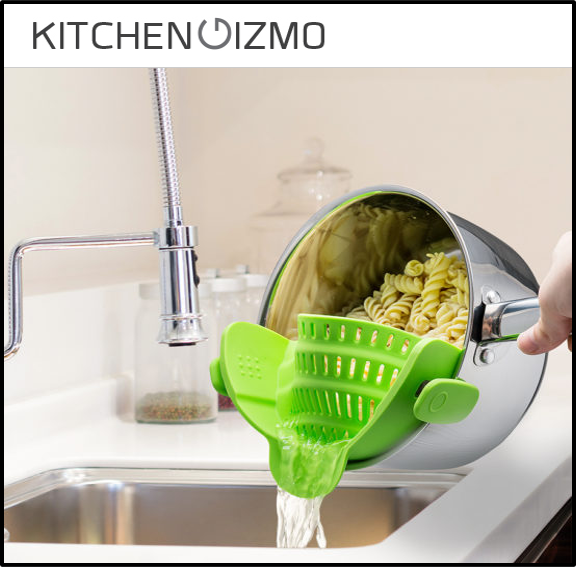 It uses double clips to secure the strainer to the sides of the pot, freeing up your hands to stabilize the pour. The added measure of safety and protection from the boiling hot water or meat juices is so appreciated! It's just an all around easier way to strain food. The half circle design does a great job of keeping the food in the pot. I don't know about you, but I'm always losing a portion of my food to the sink when I strain my food, so I love that this fixes the problem so easily. 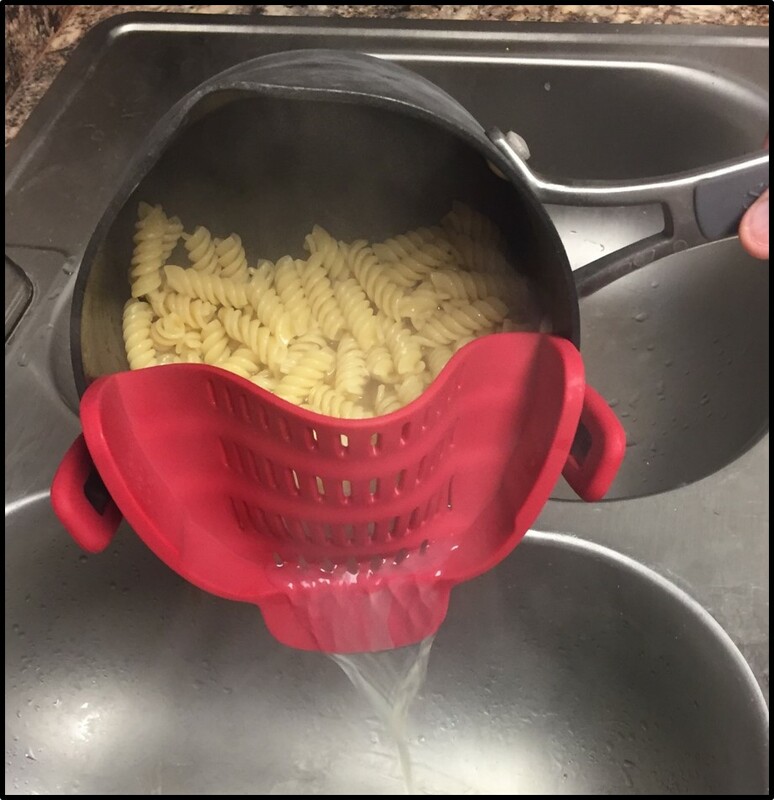 We use it for both pasta and meat juices and find that it works well. As of yet, we haven't lost anything through the slits in the strainer! With the holidays coming up, we plan to purchase a few for our family members, since we know it will be a frequently used and appreciated item. With such a low price point for a high quality product, we are very happy with the Snap'N Strain and highly recommend it! Kitchen Gizmo has a large selection of products available via online outlets or through direct calls at their website here. Check it out and order it directly to your door! Disclaimer: The products in this post were provided by Kitchen Gizmo. As always, our posts are our own honest opinions.